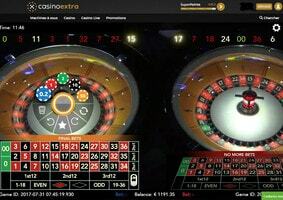 Streamed from the Saint-Vincent Casino in Italy, Authentic Roulette Double Wheel is one of the versions of live Roulette offered by Authentic Gaming. This developer, who is expanding within the sector ,specialises in live dealer roulette tables and ensures that its players have really enjoyable gaming experiences by providing unusual games like this double wheeled Roulette. Any Roulette player looking to experience a new adventure should try Authentic Roulette Double Wheel . It’s one of the rare and at the moment possibly the only live roulette table with two wheels at one table. More than two thousand spins are streamed every day from these two wheels which are placed side by side. The games on each wheel take place independently and the results are also announced independently. The rules are those of American roulette but with some modifications that are to the players’ advantage. Like in almost all of its games, Authentic Gaming has included functions that make each game even more immersive. It is commonly believed that American Roulette tables are the least advantageous for players due to the 00 slot that gives the casino a significant advantage. However, even though it has been inspired by this variation, Authentic Roulette Double Wheel doesn’t follow this rule. The developer has adjusted the game’s rate of redistribution bringing it to 97.37% which is a great help for players who can hope to win more frequently. At this table Authentic Gaming also offers better payment levels than in the classic game. Authentic Gaming software is known for the high betting limit at its tables. In a way this is the case for this table where the bets start at 20 cents. The maximum full bet (on a single number) is fixed at €25. For other types of bets one can go as high as €500 per spin. This online roulette table is aimed at beginner players as well as at high rollers. So you can play just like in land based casinos in Las Vegas, Macau, Monaco or Singapore. To play Authentic Roulette Double Wheel from Authentic Gaming software you just have to go to one of the developer’s online casino partners. These include ExclusiveBet, Lucky31 Casino and DublinBet which offer Authentic Roulette Double Wheel and all of the developer’s other live roulette games. Dublinbet also has gaming tables from 5 other software providers including the legendary Evolution Gaming.